What looks fabulous on one person may look hideous on another depending on style and body type. Some clothing items, however, have a universally bad rep, making them an eyesore on almost anyone. These notoriously unsightly clothing items are often reintroduced as a gag or ironic gesture, particularly when representing a particular decade for costume parties. They also make resurgences from time to time when the bright sparks in the PR industry decide to make certain items into a ‘thing’. Yes, I’m talking about the Australian Football League (AFL) and 2015’s Team Ugly Sweaters campaign. Someone high up the chain decided that they would officially release a line of team-themed festive jumpers that play on the ugly Christmas sweater conundrum, and sell them to their loyal and dedicated AFL fans. Unfortunately, a 2016 line has also been released in time for the silly season, which means that this is a trend likely to continue. But ugly jumper syndrome doesn’t all have to be footy-themed. 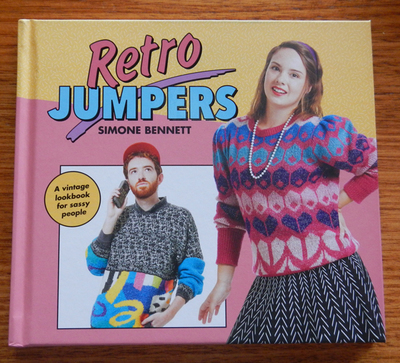 Simone Bennett has created a look-book of sorts, featuring a cringe-worthy range of jumpers and sweaters. This collection plays on the most extreme cases of woolly madness and patterned atrocities, and is modelled by a group of people whose dedication to their fashion theme is admirable. The bold and brightly-coloured backgrounds on each photo compliment the model and the outfit they are wearing, particularly highlighting the features of the jumper or sweater in question. There is also text on each page that suggests the best place or occasion to wear such an outfit, as well as handy hints and various photo montages. Whether the jumper has an animal’s head embroidered on the front, features a bright geometric mess or channels A Little House On The Prairie crossed with a questionable colour palette, you’re sure to find the ultimate ugly jumper in this book. If you know someone who loves retro fashion (in particular, ugly sweaters), then this could be the best (or worst) book that you could ever give them. You may be either encouraging a horrible situation or opening their eyes to their sins. Whatever the case, it’s sure to elicit either a pained smile or a pained grimace, it’s up to them which one it will be. Do you read biographies of bands before you see them live? Have You Embraced The Adult Colouring Book Trend?